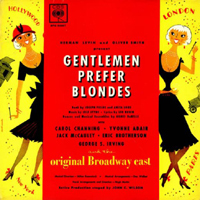 Film Soundtrack, 1953 (MGM/various CD labels) (3 / 5) With the most voluptuous blonde of all cast as Lorelei Lee, Gentlemen Prefer Blondes became a fine piece of Hollywood fluff, made classic by Marilyn Monroe’s presence. Six cuts from the soundtrack were originally released by MGM records (oddly, since this was a 20th Century-Fox film), and have been reissued on several albums by various labels over the years. They’re great fun, but by no means representative of the Broadway score; only three of the Styne-Robin songs are included, and the new material is middling Hollywood musical fare. Jane Russell shares star billing with Monroe, and is vocally appealing. The highlight of the recording is “Diamonds Are a Girl’s Best Friend” in an overtly sexual performance by Monroe that’s extremely different from Channing’s brilliantly funny rendition. — G.A. 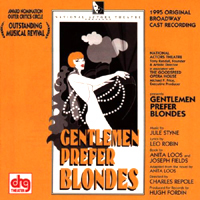 Broadway Cast, 1995 (DRG) (2 / 5) Although this recording features a talented, enthusiastic cast, it’s almost heartbreaking to hear Jule Styne’s jazzy, brassy score played by what is basically a chamber orchestra. True, the orchestrations are skillfully reduced and expertly conducted, but this is not the type of score that lends itself to an intimate sound. The good-natured performers KT Sullivan (as Lorelei Lee), Karen Prunzik, George Dvorsky, and Allen Fitzpatrick simply don’t have the proper musical setting in which to shine. Their singing is fine but never delivers the rush of excitement that comes from a big Broadway show or the feel of the Roaring ’20s. Also, the small cast compromises the sound of the big choral numbers “High Time” and “Bye, Bye, Baby.” This album does have some pluses, however. The classic “Diamonds Are a Girl’s Best Friend” is performed uncut by Sullivan, so lovers of witty lyrics can enjoy every spicy verse of the song. Also note the interpolated Styne number “A Ride on a Rainbow,” an ingenious little charm song, beautifully sung by Dvorsky and Prunzik. But overall, as this musical’s earlier stage and film versions prove, it works better when it’s played big. Since the original album with Carol Channing is still readily available, there’s little reason to hear this version other than curiosity. — G.A. Encores! Cast, 2012 (Sony Masterworks) (4 / 5) This is a vibrant and successful re-recording of the catchy Jule Styne-Leo Robin score. The original orchestrations and choral arrangements are intact, and it’s wonderful to hear them in digital stereo. The stars are also terrific. Rachel York as Dorothy gives a stylish and dynamic performance; her melodious, colorful voice is front and center while backed up by some thrilling late 1940s (masking as ’20s) choral sound. 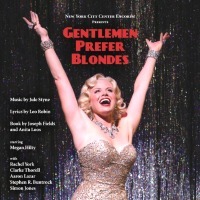 But the real star here, as she should be, is Megan Hilty as Lorelei Lee. Her vocals are perfectly clear and right on pitch, so we get to hear the music as never before; not that there’s anything less than fabulous about Carol Channing’s or Marilyn Monroe’s performances of these songs, but their unique vocal stylings do not put the tunes front and center as Hilty does. Especially enjoyable is her take on “Little Girl From Little Rock.” Here, she goes for all the wit and melody, and she hits out of the park the naughty lyrics that were sadly unused in the film version of Gentlemen Prefer Blondes. But that’s not all: Fans of “Diamonds Are a Girl’s Best Friend” will be glad to hear Hilty sing all of the choruses and encores of this classic comedy song. There’s also very fine support from Clarke Thorell, who croons “Bye, Bye, Baby” etc. to perfection. Add to this the gorgeous voice of Aaron Lazar in such Styne-Robin ballads as “You Say You Care,” and you have a superior cast overall. The only drawback of this recording lies in the score itself; much of what’s here is excellent, of course, but it seems like a “short score,” unfinished by today’s standards. You can’t help but longing for a few more hits, and some of the songs fail to rise to the level of the gems in Styne’s scores for Gypsy and Bells Are Ringing. Perhaps that’s why 20th Century-Fox dropped some of the lesser numbers and added two excellent Hoagy Carmichael songs to the film — and why, when this show was revived for Carol Channing in the 1970s and renamed Lorelei, it had several new songs with music by Styne and lyrics by Betty Comden and Adolph Green. Although this cast album is very well done, it falls just a little short of ultimate entertainment value. — G.A.